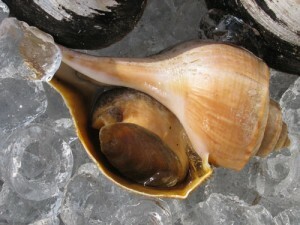 Whelks are large, edible gastropods. 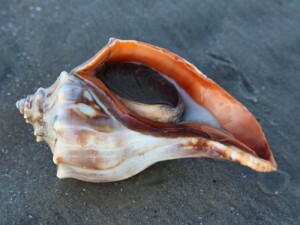 Three species are harvested along North America’s Atlantic Coast; channeled whelk (Busycotypus canaliculatus), knobbed whelk (Busycon carica), and lightning whelk (Busycon sinistrum). The tough but full-flavored meat of whelks is typically sliced thin or chopped and used in chowders, fritters, and other dishes. A canned whelk product, known as scungilli, is popular in Italian cuisine.